Motorcycle boots are associated with motorcycle riders and range from above ankle to below knee boots. They have an outside of a typical boot but a low heel to control the motorcycle. To improve motorcycle safety, motorcycle boots are generally made from a thick, heavy leather and may include energy absorbing and load spreading padding, metal, plastic and/or composite materials to protect the motorcycle rider's feet, ankles and legs in an accident. For use in wet weather, some boots have a waterproof membrane lining such as Gore-Tex or SympaTex. Depending upon how form-fitting the boot is, to allow a rider to easily get the boot on or off, the shaft may be designed to open lengthwise. If so, Velcro or other hook-and-loop fasteners are typically used on the inner sides of the opening to allow the rider to close the boot over the foot, ankle and leg. This allows for some flexibility for the rider to control the boot's tightness. Some manufacturers also include an internal quick-lacing system between a soft inner leg and the harder outer shell of the boot shaft to further ensure a tight, but comfortable fit. The heel of a racing boot is typically very low: not more than 1/2-inch, and sole of the heel and foot is typically rather smooth. A curved plastic or composite plate may be included to cover the shin of the boot to protect the rider's shin. 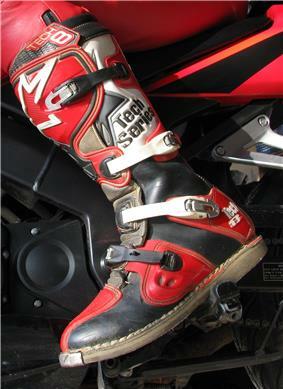 Similar to touring boots, racing boots are designed for riding a motorcycle on hard pavement (either the street or a race track) and are usually between 10 and 14 inches in height and made from a combination of leather, metal, plastic and/or man-made composite materials to create a form-fitting, but comfortable boot. The amount of armored protection provided by racing boots is usually greater than touring boots due to the increased potential for injury at the high speeds needed for racing. Another feature which is normally installed and can be recognized as "Gear Change Panel" M/O Plastic or TPU types of materials. Similar to racing boots, touring boots are designed specifically for riding a motorcycle on hard pavement, but with less armored protection than racing boots since they are intended for riders that typically ride on city streets and highways, not race tracks. They are usually between 10 and 14 inches in height and made from a combination of leather, metal, hard rubber, plastic and/or man-made fabrics to create a form-fitting, but comfortable boot. Motocross boots are designed specifically for off-road, motocross (MX) or all-terrain vehicle riding. To help prevent a rider's feet and legs from being injured, motocross boots are typically much stiffer than regular motorcycle boots or racing boots, but are more flexible than ski boots by comparison. 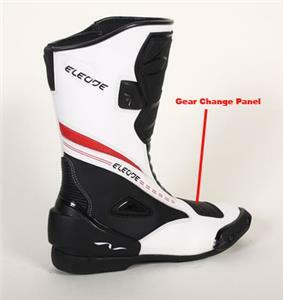 Modern motocross boots are usually nearly knee-high (about 16 inches in height) and made from a combination of leather, metal, plastic and/or man-made composite materials to create a very form-fitting, comfortable and tight boot. To allow a rider to easily get the boot on or off, the shaft of a motocross boot is designed to open lengthwise. 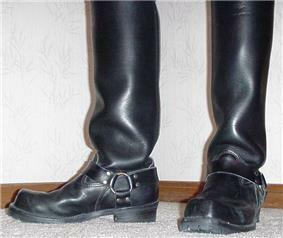 Multiple adjustable straps (usually 3 to 4) are deployed along the foot, ankle and shaft of the boot to allow the rider to tighten the boot to his/her preferences and comfort. A curved plastic or composite plate covers the shin of the boot to protect the rider from debris that may be thrown from the front wheel of the motorcycle. 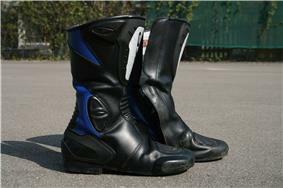 Motorcycle police boots are designed specifically to be worn by motorcycle police officers. Very similar to riding boots, motorcycle police boots are typically knee-high (between 18 and 21 inches in height), the foot and shaft are made from black, smooth-grained, high-gloss leather and the low-heeled sole is made from hard rubber. 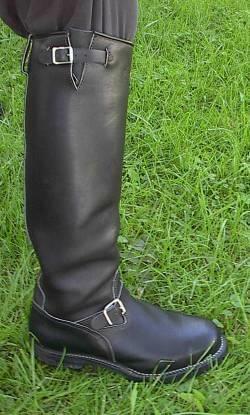 The boots are typically form-fitting and intended to be worn over breeches or jodhpurs as part of the officer's uniform. Engineer boots are a long-established style of boots used by people in a number of occupations in addition to motorcyclists. Harness boots are very similar to engineer boots. The boots are most often made of heavy weight leather and range in height from short (10 inches) to extra high (38 inches). The most typical height is between 10 and 18 inches. The most common color is black, but brown harness boots are also made. Harness boots are designed to protect the motorcycle rider from the heat of the exhaust pipes and the engine block and from injury to the foot and leg in the case of an accident while riding and may include a built-in steel toe cap and metal shank in the heel. Whereas engineer boots have a rounded toe, harness boots typically have a square toe. Unlike engineer boots that have an adjustable leather strap across the ankle, harness boots have a non-adjustable system of four leather straps and two metal rings: one strap goes across the top of the foot at the ankle, one strap wraps around the rear of the foot at the ankle and two more straps rise from sole on either side ankle. The four straps are held in place by the two metal rings that are located on either side of the ankle. Typically, these boots possess a pair of pull-straps on either side of the tops of the shafts. Some manufacturers replace these straps with an adjustable leather strap located on the outside top of the shafts, similar to engineer boots. Soles and heels are usually made of hard rubber and may either be relatively flat or may have lugs for increased traction. Harness boots were originally modeled on the square toed boots prevalent in the 19th century, including those worn by American Civil War soldiers. Leather straps and rings were added to this style in the 1960s, creating the modern version of the harness boot, which quickly became a classic. 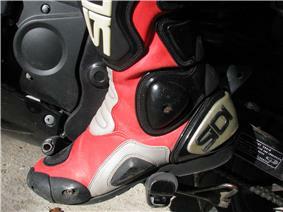 There is a European standard available for motorcycle riders which should be applied to all footwear for this end use. This standard EN13634 (latest version to date is EN13634:2010) is titled "Protective footwear for motorcycle riders — Requirements and test methods" and is a European harmonized standard published throughout Europe and in the UK by BSI. The PPE directive (the law covering certification of Personal protective equipment) covers any device that is worn or held to protect the user. The Basic health and safety requirements of the directive include the risks or mechanical abrasions and impact and risk to the health and hygiene of the end user. It is clear therefore that motorcycle boots are PPE and should be CE marked and tested by a notified body laboratory. They are neither complex or simple design as defined in the directive and the harmonized standard EN13634 should be used to permit CE marking. 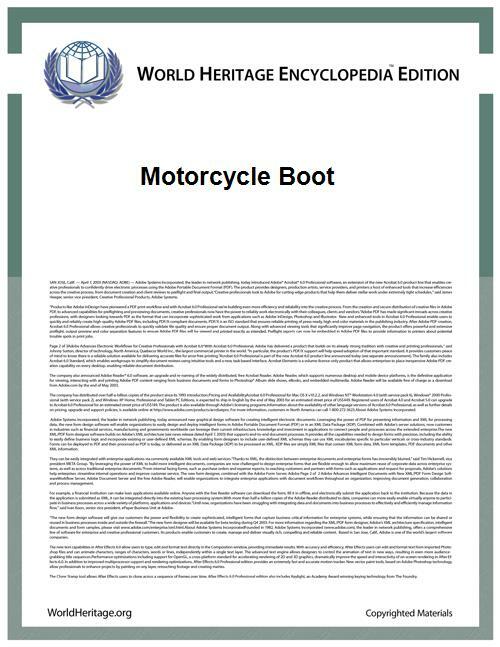 The latest version of these standards has been written in such a manner as to apply to all motorcycle footwear (no longer just for professional use). It is therefore applicable by law, to all items of motorcycle footwear claiming or implying any form of protection to the user. - The abrasion test, an impact abrasion and quite a harsh method of test. - Design requirements for no forward facing seams to prevent the boots opening up during a slide. - There are requirements for transverse rigidity to reduce the risk of crushing if the bike falls on you. The results of some of the testing in the standard are recorded on the boot as levels which help the user determine a good boot for their risk. For example the requirements of a trials bike rider are quite different from those of a courier - impact protection vs abrasion. It is important to note that most of the motorcycle footwear on the market is non CE marked and will not meet these standards. This includes many products that look like they offer protection against impacts and abrasions for example, most of these are illegally making claims of safety. The standards are put in place for your safety and buyers should look for CE marked product claiming compliance with EN13634:2010 with motorcycle pictogram clearly marked on the products.